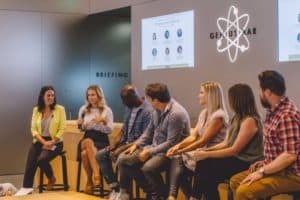 Last week’s social media marketing expert panel at the Apple Store in Pasadena sold out fast. So if you’re one of the many who missed it, you’re in luck—we’ve got the 10 most awesome pieces of advice they offered, right here. The Apple Store in Pasadena gets a constant barrage of marketing-related tech questions that go beyond their hardware expertise. To help address some of these questions for its clients, the store asked Pasadena-based branding agency Echo-Factory for help. We put together a series titled, “New Tech in Old Pasadena,” and held the first discussion August 10 at the store. The discussion, called “Extending Your Brand On Social Media,” featured a panel of social media experts from top companies of various sizes, including Senior Brand Manager Peyton Moore, who also moderated the panel, and Director of Strategy Nicole Rohrer from Echo-Factory; Malcolm Gray, who handles digital marketing at the global leader in entertainment and ticketing, Live Nation; Paul Meyers, director of digital and social media marketing at Pabst Brewing Company; Taryn Rothstein, creator of the popular lifestyle city guide, Pasadena Charm; Tara Cunningham, who manages partnerships and business development at the Venice-based social software developer, Epoxy; and Jonathan Jordan, business specialist at the Apple Store. In case you missed the sold-out show, here are the top 10 takeaways. #1 – You don’t need to have a presence on all of the social platforms. Really. Yes, it’s true. If you’re one of the many new business owners overwhelmed by the growing number of social outlets in cyberspace, you can let out a sigh of relief. Not only do you not need to fuss with all those sites, you really shouldn’t. And here’s why: Not all social platforms are appropriate for all industries. Do some research to find out which platforms are relevant to your industry and your customer community. Then focus your energies on those few. Just like everything else, you want to be thinking about your ROI. For example, if you run a B2B company, there’s a good chance your Facebook profile is a waste of your precious time. But every ounce of effort you give to your LinkedIn company page and personal profile is pure gold. Careful profile selection is also critical if you’re operating on limited time because it ensures that, on those days when you can’t do much more than answer a quick question or like a customer’s post, you’re getting the most out of your efforts. “I want to look at all kinds of boring pictures of products on Facebook!” said no social media user ever. Don’t let your social profiles look or feel like the digital equivalent to a used car lot. Rather, approach post creation with the mindset that your company is part of the community it’s speaking to. These are people you like and with whom you want to build a relationship based on trust. So share with them the kind of information you’d appreciate from a trusted and/or high quality source yourself—think tips, tricks, hacks, insights, relevance, funny, fun, beautiful, useful, newsworthy, awesome. #3 – One size does not fit all. Think of it like pants and kids. If you wanted your six-, ten- and 15-year-old kids to wear matching pants (some people do this), you’d buy pants made from the same fabric in three sizes, not three pair of the same size pants (we hope). The same is true with social posts. While the content in one post might be appropriate across channels, its presentation likely is not. No one is going to watch a seven-minute video on Twitter. On Facebook, though, the algorithm actually prioritizes native video posts. So where you’d post a link to YouTube on Twitter, you’d post the entire seven-minute video on Facebook—same content, different delivery. Each outlet has its own unique and ideal post formatting, which is easy to learn with a bit of research. #3 – Don’t do nothing. You can’t afford to avoid social media (or use double negatives). Even if you have extremely limited time to dedicate to it, something is better than nothing. If consistent, a few likes, comments, thank-yous and quick shares here and there each day can go a long way to establish your company’s social presence. Set a personal goal to interact in some way on your outlets every day. #4 – Paid media can be an awesome tool. Left to right: Peyton Moore, Nicole Rohrer, Malcolm Gray, Paul Meyers, Taryn Rothstein, Tara Cunningham and Jonathan Jordan. Whether utilizing “pay to play” is a good or bad move depends on (1) your industry and (2) your method. For example, the social media content for a local lifestyle guide will be profoundly more intimate in nature than that of a large B2B corporation. So, where the guide might want to limit paid efforts, a company introducing a new product could do really well with a paid giveaway campaign. The most important thing is to do it right. If a method seems a bit lowbrow and cheesy to you (read: Get 10K followers in 1 Day! ), it’ll seem that way to your would-be followers, too. Avoid seeming spammy at all costs. Also, be thoughtful about your campaigns. For example, you don’t want your followers to accidentally sign up for an expired contest. So when it’s over, get rid of the entry call-to-action posts. #5 – Balance real-time posting with planned content. Content calendars can be extremely helpful for establishing a consistent presence (check out this article on Hubspot for some great tips), but they shouldn’t be all you do. 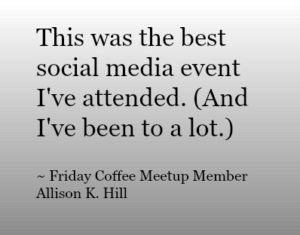 Social media is in real time, so to have a relevant presence, you need to be in there looking around and engaging with your community every day. As mentioned above, real-time engagement doesn’t need to be a big deal. Share a news story, like a post, thank a new follower. Look alive! #6 – It’s okay to mix business and personal… sometimes. Going back to the lifestyle guide example above: Many such entities are run by one well-known member of a local community. In such cases, the thoughtful blending of personal and business profiles could be totally appropriate and valuable. But in other cases, such as a law firm or business software developer, it may be best to keep your weekend shenanigans on the down low. Really, this is a classic common sense sort of thing. #7 – Don’t fear negative feedback. If people post complaints and criticisms on your social pages (and they will), don’t head straight for the hide button. These kinds of exchanges between you and your community can be extremely valuable if handled the right way. People will be displeased with your company from time to time—it’s just reality—but this gives you the opportunity to let your customer service abilities shine like the morning sun. And, by all means, never engage in a less-than-professional exchange, which will serve only to make you and your business appear, well, less than professional. One quick note. There are two instances when the hide button is your best friend: (1) You’ve done all you can to make someone happy, but the conversation has been reduced to a days-long spiral of frustration and futility, or (2) you’ve been attacked by an all-out hater whose comment leaves no room for any sort of logical response (e.g., I hate you and your stuff). #8 – Third-party platforms are not the devil. While you definitely don’t want to make an automated third-party platform your only source of content posting, these applications have some awesomely valuable features. For example, they typically facilitate post scheduling, which is great for establishing a consistent social presence. Tools like Sprout Social and Hootsuite also offer unmatched reporting and analysis tools that can give you in three minutes the same incredibly useful data set it would take you four hours to collect yourself. Plus, these applications are awesome for managing followers and keeping a close eye on trends like the best time of day to post. Just keep in mind that some channels, such as Facebook, will assign lower priority to posts generated by a third-party platform. #9 – Top trends: Twitter customer care and video, video everywhere. Consider the Snapchat explosion of late, and it’s easy to see that video content is quickly becoming king. But not just on Snapchat. This month, LinkedIn did a controlled release of its new video feature to top influencers, and Instagram released its new Snapchat-like “stories” feature—and people can’t get enough. That said, start looking around to see how you might incorporate video content into your social presence. #10 – Grab your handles. The constant emergence of new social channels can make new business owners feel like they’re racing against the clock—so much so that many just avoid the whole thing altogether. And that’s bad. However, there is a solution: As soon as a new channel pops up, just pop in and snag your @handle or account name before someone else does. That way, you won’t wind up with “@Acme_PartsAndStuff_1234567” when the channel goes big. Then you can sit back and relax until you have time to learn the ins and outs. Pasadena has been a center for innovation since at least the 1930s. Today, with institutions like CalTech, JPL, Innovate Pasadena, and a thriving startup scene and community, that culture is stronger than ever. New Tech in Old Pasadena events connect Pasadena’s business owners and CEOs with innovative technology that can have a real effect on their bottom line. We are hosting a panel discussion on a somewhat similar topic for our alumni in the Pittsburgh area! Do you happen to have any of your questions on file from the program?